Manufacturer of a wide range of products which include laser engraver and laser cutting machine. It is regularly used in industries, like advertising, craftwork making, mould making, toy manufacturing, etc. 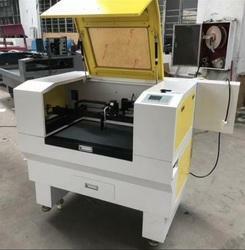 The laser cutting and engraving machine can cut and engrave on non-metal materials such as bamboo ware, wood planks, coconut shells, paper, organic glass, double color boards, acrylic, marble, jades, crystal and more. the proprietary software which supports the output of various files format: PLT, BMP, DXF, DST, AI, T100 etc. It is regularly used in industries, like advertising, craftwork making, mould making, toy manufacturing, etc. The laser cutting and engraving machine can cut and engrave on non-metal materials such as bamboo ware, wood planks, coconut shells, paper, organic glass, double color boards, acrylic, marble, jades, crystal and more. the proprietary software which supports the output of various files format: PLT, BMP, DXF, DST, AI, T100, etc.